Enhancing Pelagic Habitat Productivity in the North Delta Is it too late to save the Delta smelt? The purpose is to determine if the addition of nitrogen can stimulate plankton (fish food organisms) production in a section of the ship channel, which is isolated from the Delta in terms of water flow. Adding nitrogen to the ship channel will indeed stimulate plankton productivity. Only a few miles away, regional governments have spent decades in removing nitrogen (most recently, ammonia) from the effluent of the Sacramento Regional Wastewater Treatment Plant to reduce production of blue-green algae in the Delta. The City of West Sacramento already seasonally releases high nutrients, metals, and salts into the Ship Channel. Adding more nitrogen could easily increase toxic blue-green algae problems in the Delta, similar to the bloom that recently led to the recreational closure of southern California’s Diamond Valley Reservoir, which receives Delta water. There is higher plankton productivity in the Ship Channel than in nearby Delta channels because the Ship Channel has longer residence time, higher nutrients, and higher water temperatures. The broken gate on the Ship Channel’s northern entrance contributes to these conditions. However, lack of circulation also leads to nitrogen depletion and declining plankton production, and there is limited seasonal replenishment of nitrogen. The Delta Smelt Resilience Strategy is considering increasing flows into the north Delta from the Colusa Basin Drain, Fremont Weir, and the Ship Channel to stimulate Delta plankton blooms. The biggest problem with these sources is high spring-through-fall water temperatures (Figures 1-3). Water temperature is certainly the greatest limiting factor in the north Delta for Delta smelt; adding nitrogen will not fix this problem. Fixing the gate at the north end and allowing cooler Sacramento River water (strong American River influence) into the channel (Figure 4) would reduce water temperatures in the Ship Channel. Just a few degrees can be life or death for Delta smelt. Increased entry into the Ship Channel of Sacramento River water would also introduce more nitrogen, potentially reducing the need to fertilize the Ship Channel with crop dusters. Figure 1. 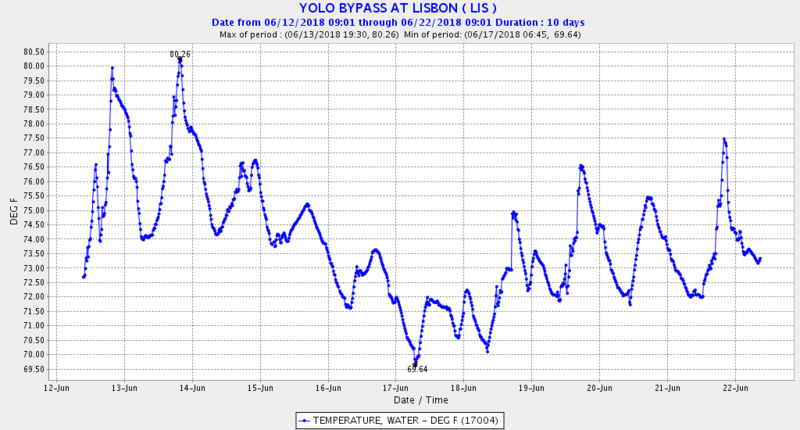 Water temperature in the Yolo Bypass downstream of the entrance of the Colusa Basin Drain. Figure 2. 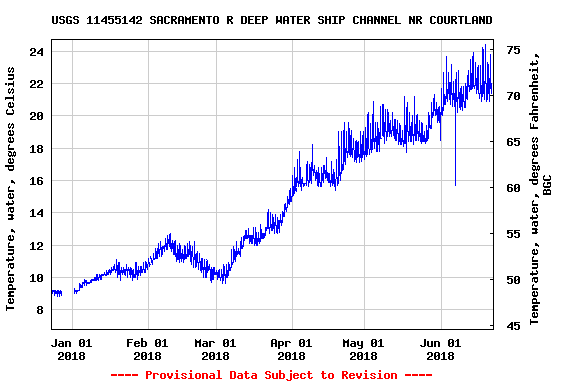 Water temperature in the Sacramento River Deep Water Ship Channel. Figure 3. 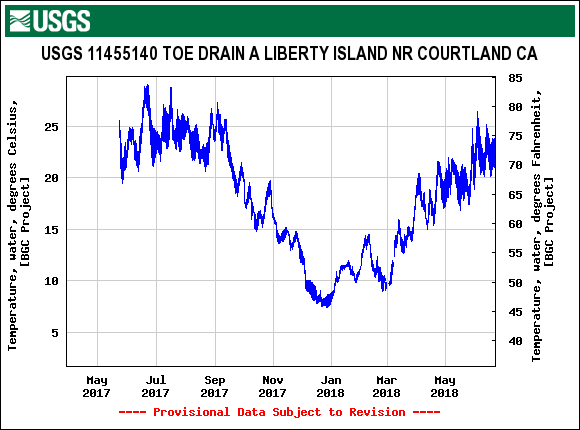 Water temperature in the lower Yolo Bypass toe drain canal near Liberty Island. Figure 4. 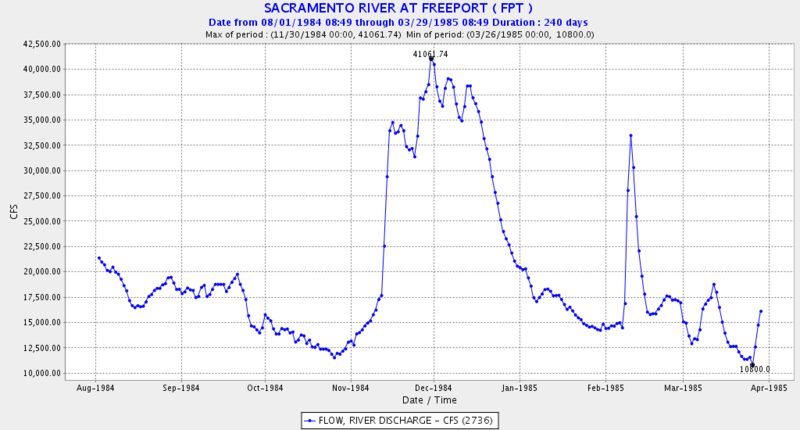 Water temperature in the Sacramento River near Freeport downstream of the entrance to the Sacramento River Deep Water Shipp Channel. 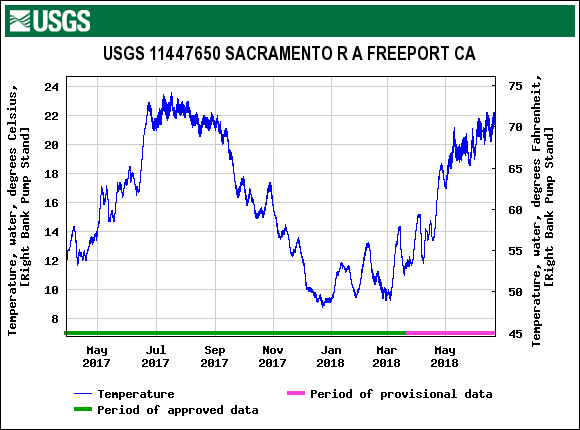 Water temperatures in the lower Sacramento River over the past month have often exceeded water quality standards that protect salmon and other beneficial uses (Figures 1 and 2). Water temperatures at or above the standard of 68oF adversely affect adult and juvenile salmon. 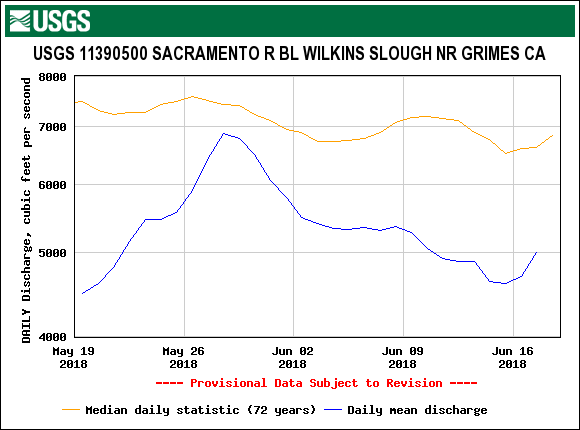 Water temperatures can meet the standard if the Bureau of Reclamation maintains flow in the Sacramento at Wilkins Slough at 6000-8000 cfs, depending on air temperature. The Bureau of Reclamation has maintained such flows in the past to meet water quality standards and terms in its water rights permits (Figure 3). Shasta Reservoir water storage is 102% of normal as of June 18, 2018. Water diversions from the Sacramento River upstream of Wilkins Slough are approximately 6,000 cfs, with 100% allocation to CVP contractors under water right permits. For more on the effects on salmon, see past posts. Figure 1. 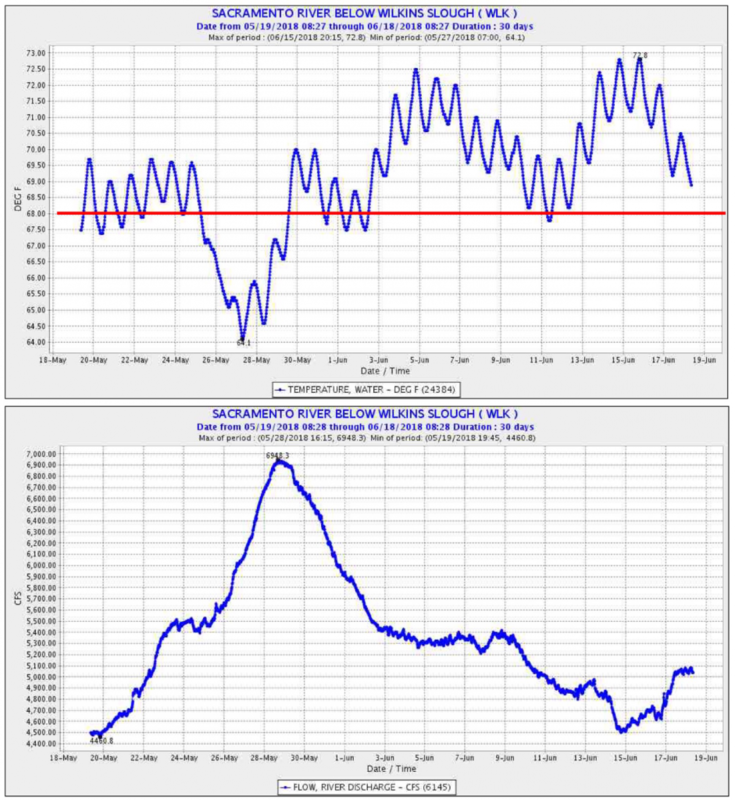 Sacramento River flow and water temperature at Wilkins Slough in lower Sacramento River: mid-May to mid-June 2018. Red line denotes water quality standard. Source: CDEC. Figure 2. 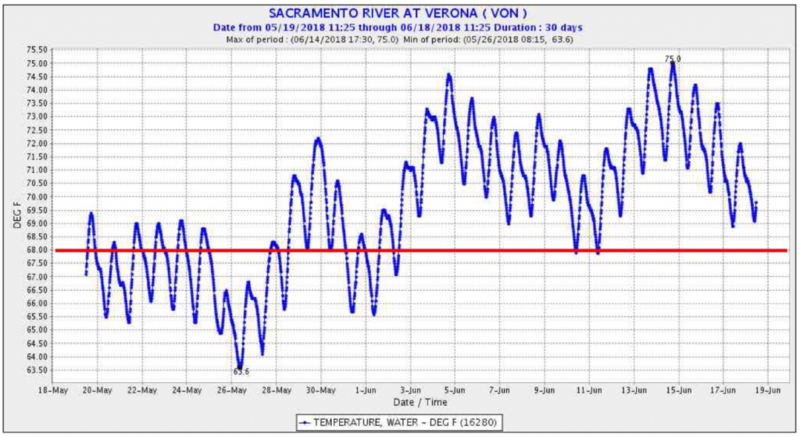 Sacramento River water temperature at Verona in lower Sacramento River: mid-May to mid-June 2018. Red line denotes water quality standard. Source: CDEC. Figure 3. Historical and recent flow at Wilkins Slough. Source: USGS. In an April 2018 post, I revisited the 2007-2009 salmon crash and warned of the current 2016-2017 crash. In an April 2017 post, I opined on the status of population and its future given the population crashes. In this post, I update the population data with preliminary estimates of the 2016 and 2017 runs, including (1) the in-river estimate from the spawning grounds between Keswick Dam and Red Bluff (Figure 1), and (2) Coleman National Fish Hatchery (CNFH) and Battle Creek (Figure 2). I developed a stock-recruitment relationship using the in-river data shown in Figure 1. A plot of the population-produced from spawners three years earlier (Figure 3) shows extremely poor runs for 2016 and 2017, given the number of parental spawners three years earlier. The red numbers reflect drought conditions winter-spring of 2014 and 2015, when these broods were rearing and migrating in the Sacramento River in the first few months of their lives. The earlier posts covered the factors that led to poor survival in the drought years. Forecasts for the 2018 run are mixed. Higher jack numbers in the 2017 run likely foreshadow improvements in the adult 2018 run. Based on the Figure 3 relationships, the higher 2015 run, along with normal year conditions (a green number) for winter-spring 2016 compared to 2014 and 2015, would also indicate an improved run for 2018. A forecast for 2019 and 2020 runs, given the poor runs in 2016 and 2017, is risky at best, despite reasonably good winter-spring conditions in 2017 and 2018 compared to drought years 2014 and 2015. A lack of recovery to 2015 spawner levels in the fall 2018 run would be a serious concern. Figure 1. 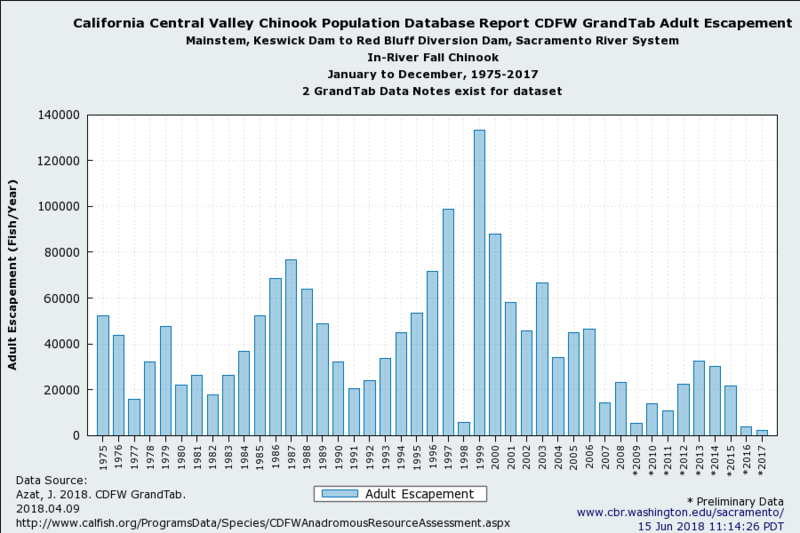 Run size estimates (escapement) of fall-run Chinook salmon from spawning grounds in the upper Sacramento River between Keswick Dam and Red Bluff from 1975 to 2017. Figure 2. 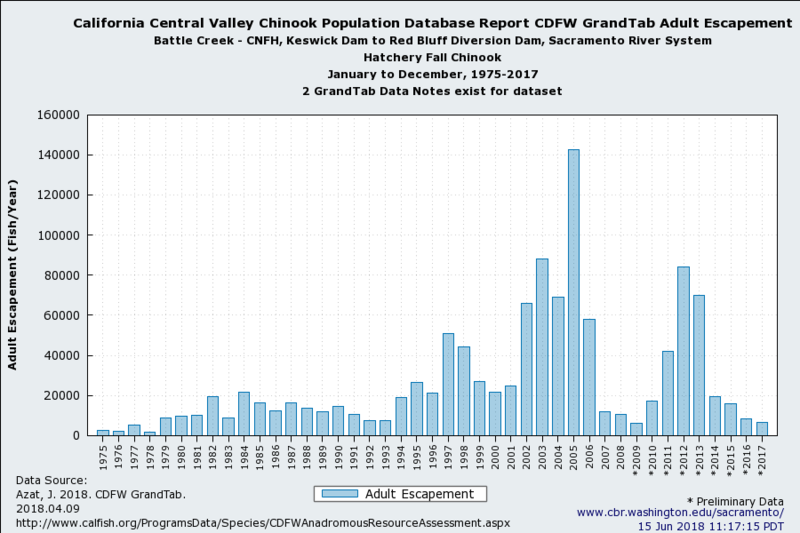 Run size estimates (escapement) of fall-run Chinook salmon from the Coleman National Fish Hatchery on Battle Creek near Red Bluff from 1975 to 2017. Figure 3. 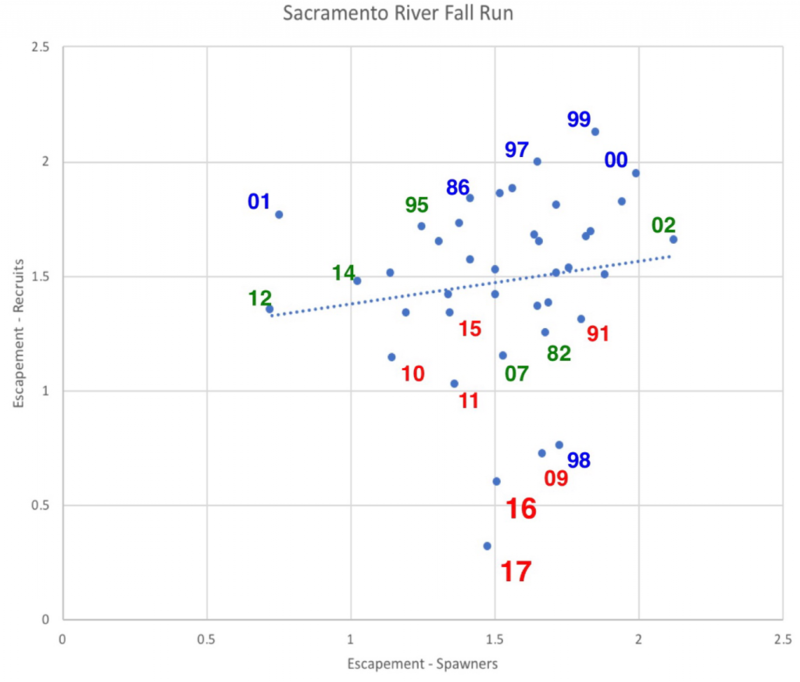 Spawner-recruit relationship for fall-run in-river estimates of run size from Figures 1 and 2. Number indicates spawner estimate for that year (y-axis) as derived from spawners three years earlier (x-axis). Color indicates winter-spring rearing-migration conditions for that brood (winter-spring 2015 for spawners in 2017). Red denotes dry year in first winter-spring. Green is for normal years. Blue is wet years. The proposed Sites Reservoir1 would be a new off-stream storage reservoir covering 12,000 -14,000 surface acres with 1.8 million acre-ft of storage capacity on the west side of the Sacramento Valley (Figure 1). The project would capture and store unregulated Sacramento River winter-spring runoff and some water previously stored in Shasta Reservoir. The diversion capacity to the reservoir would be 5400-6500 cfs, supplied by two existing river diversions (up to 1800 cfs at Red Bluff; up to 2100 cfs at Hamilton City) and a new diversion near Colusa (proponents are evaluating alternative capacities of 1500 and 3000 cfs, in addition to the currently preferred capacity of 2000 cfs). The Sites Authority webpage estimates that it could have diverted over 1 Million acre-ft to storage in Sites in 2018 and 1.8 Million acre-ft to storage in 2017; these figures assume bypass flow requirements at the diversion points and at Freeport, and sufficient storage capacity in the reservoir. The Draft Environmental Impact Report/Environmental Impact Statement (DEIR/DEIS) for the Sites Reservoir Project estimates the average annual diversion to Sites storage at about 500,000 acre-ft; actual diversions would vary depending on hydrology and regulatory constraints. As an off-stream storage reservoir, Sites would store water behind a dam that is not on a major waterway. Water diverted to the reservoir would be pumped into canals from the Sacramento River, and then pumped into the storage reservoir from small holding reservoirs on the canals. The two existing diversions that would fill Sites have modern fish screening facilities. As currently envisioned, a pump-back hydroelectric operation would allow partial recovery of pumping costs. The Sites project has potential benefits for fish, but also the potential to worsen conditions for fish. Under current operations, existing irrigation diversions on the Sacramento River draw water primarily in spring and summer via several major canal systems on the west side of the Sacramento Valley. These diversions draw mainly on water that was previously stored in Shasta Reservoir and released to the Sacramento River in part to keep river water temperatures cool. Shasta Reservoir’s cold-water pool varies in volume depending on storage and other factors, and can run out if it is not managed carefully. If the cold-water pool is depleted at the end of the summer, this threatens the viability of winter-run salmon. Under current operations, spring and summer irrigation diversions from the Sacramento River also cut flow and raise water temperatures in the lower river, which harms salmon, steelhead and sturgeon. Water diverted to storage in Sites in the winter could substitute for some of the spring and summer irrigation deliveries that currently come from Shasta. A greater percentage of water released from Shasta in spring and summer could then flow all the way to the Delta. More water could also be retained in Shasta Reservoir to protect the Shasta cold-water pool into the fall and as carryover for the following year. If more water were delivered to the Delta from Shasta Reservoir in the spring and summer, less water would theoretically be needed from Folsom and Oroville reservoirs to meet Delta water quality, outflow and other requirements. This could allow more targeted releases of water into the lower American and lower Feather rivers to protect fish in those waters. It could also allow better maintenance of cold-water pools and greater carryover storage in Folsom and Oroville, also very important for the respective fisheries downstream. Water stored in Sites could be delivered directly to the Delta via the Colusa Basin Drain (CBD) system and Yolo Bypass, reducing outflow demands from other Valley reservoirs. Water delivered directly to the Delta from Sites would be of higher potential productivity and could stimulate winter-spring Bay-Delta plankton blooms that would benefit Delta native fishes. The proposal includes a new point of diversion on the Sacramento River with a capacity to divert 2000 cfs. This would give the project higher diversion capacity and the capability of diverting tributary runoff that would otherwise be unavailable to the two upper river diversions that now enters the Delta. This diversion would also affect flows and water temperatures in the lower Sacramento River, and subject migrating juvenile salmon, sturgeon, and steelhead to a third large screening facility. The new point of diversion would be particularly problematic if it diverted water outside the peak runoff season (late fall through spring). The new diversion and the reoperation of canal intakes at Red Bluff and Hamilton City to divert water in winter would compete for water with Delta diversions and would affect Delta outflow to the Bay. Water deliveries and hydropower releases from Sites Reservoir to the lower river at the new diversion site could affect water quality in the lower Sacramento River. With available winter off-stream storage, the existing diversions at Red Bluff and Hamilton City would be capable of diverting uncontrolled flows from tributaries that have otherwise remained relatively untouched down to the Delta. The greater diversion capacity may increase demands on Shasta storage and will increase diversion of uncontrolled tributary flows, further compromising fishes in the Sacramento River and the Bay-Delta. A small but potentially significant amount of water supply stored in Sites Reservoir would be lost to evaporation and groundwater seepage. Above all, there is too much unknown to evaluate how Sites would affect fish. As is the case for most proposed water supply projects, the project description in the draft DEIR/DEIS for Sites describes several potential configurations of project infrastructure and a description of proposed constraints. The DEIR/DEIS does not evaluate different constraints, such as different bypass flow requirements past each point of diversion; the DEIR/DEIS only evaluates one value for each point. In spite of numerous requests that the DEIR/DEIS evaluate project diversions with more stringent Delta flow and water quality requirements than the existing inadequate ones, the DEIR/DEIS only evaluates project yield with existing Delta constraints. The benefit side is even more vague and conceptual. The entire construct of hypothetical Sites benefits would in fact require a new type of proscriptive rules and enforcement mechanisms that would be unprecedented for California water projects. There is simply no clue in any of the Sites literature what those rules would be or even could be. The project description places no numbers on how much water stored in Sites the project’s operators would dedicate to actions designed to benefit fish. The project description defines no decision-making process for dedicating water to fish, other than to say that on an overarching basis fish agencies will decide. The project description defines no way in which project operators will apportion water for fish against water for water supply. For all the offsets that seem to comprise the lion’s share of fish benefits, the project description does not say how water from Sites will generate improvements in operation of state or federal reservoirs, or whether it will be Sites operators or state and federal operators who make the calls. Then there is the question of whether there would be any offsets at all. There is no assurance that there will be any decreases at all in water use from Shasta or from other state and federal reservoirs. Water freed up by using Sites to meet Sacramento Valley water supply could simply allow Sac Valley water users to irrigate more land or sell more water for export at the Delta pumps. The DEIR/DEIS proposes no mechanism of enforcing offsets: who would regulate the project’s use of water, who would manage the interaction between Sites water and water from Shasta, Oroville, Folsom and perhaps Trinity reservoirs, and how and against whom any requirements would be enforced. There are other problems. A shift to winter-spring diversions and use of canal systems would potentially change groundwater recharge and use patterns in the Sacramento Valley. The project would compete for water available to the proposed WaterFix Twin Tunnels project in the Delta. Sites and WaterFix have their “sights” on the heretofore untouched tributary inflows that are also protected by Delta export OMR limits so the flows reach the Bay. There will be a big fight over this uncontrolled water that now makes up a significant portion of the Bay’s freshwater input in drier years. Both projects have claimed future benefits of the same pot of water. There are potential benefits from Sites project’s main features to Central Valley fishes, including salmon, steelhead, sturgeon, smelt, and striped bass. Most of the benefits would result from switching the diversion time period of the two existing upper river diversions and Shasta reservoir releases to these diversions. The added new diversion and increase in winter diversions will at important times reduce Sacramento River flow and Bay-Delta inflow and outflow, harming fish in certain but sometimes hard to quantify amounts. Past water developments in the Central Valley have overwhelmingly made conditions for fish worse. The Sites project proponents claim that their project will be different. These proponents have not done themselves, the public, or public policy any favors by relying on generalities and politics as the centerpieces of their efforts to advance their project. At this time, there are too many unknowns to meaningfully evaluate the possibility that benefits might outweigh the harm and justify the costs. In the meantime, it is a reasonable working presumption that the Sites project will worsen conditions for fish as well. Figure 1. 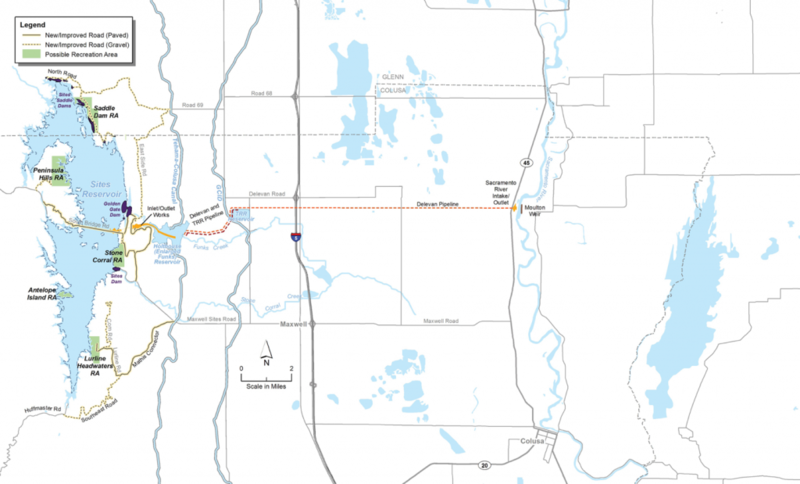 Proposed Sites Reservoir and associated infrastructure on west side of the Sacramento Valley. 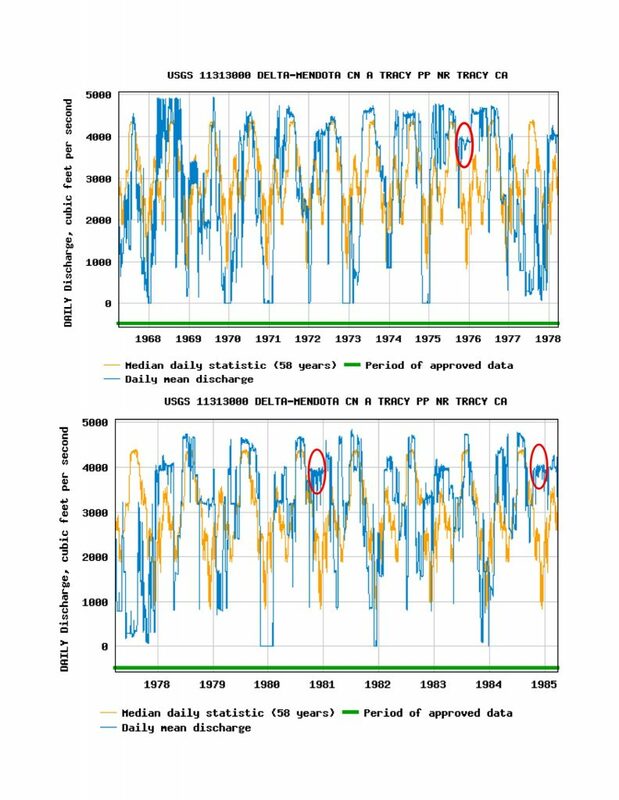 In a March 14, 2018 post, I discussed my long-held theory that the winter-run salmon decline was caused in large part by high fall exports from the Delta that began in the mid 1970s. In this post, I add some further insights on the theory and why it is so important. First, when the State Water Project came on line in the late 1960’s, potential export pumping more than tripled from 4,400 cfs to 15,000 cfs. In reality, increases in previously low federal fall exports, along with higher state exports, led to much sharper increases in fall exports, particularly in 1975, 77, 80, 82, and 84, coincident with the primary period of winter-run decline from 1975-85. The fall export increase is very evident in the federal export record (Figure 1) and state export record (Figure 2). Second, the high exports and high salmon salvage observed were not always associated with high Delta inflows. 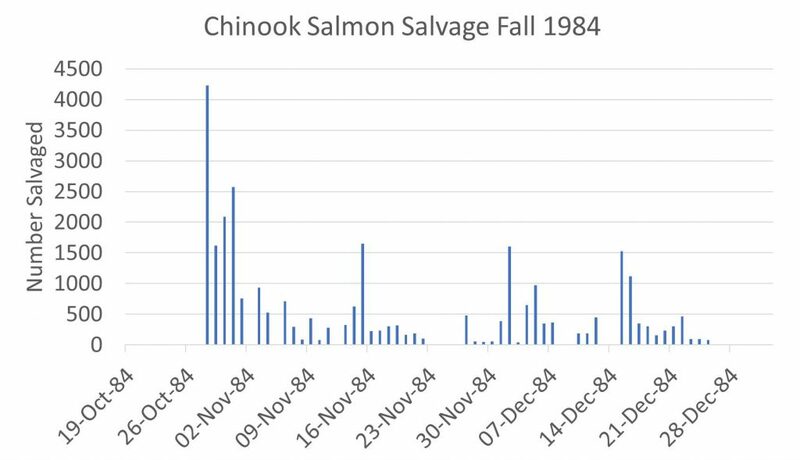 High salvage of winter-run sized juvenile salmon at south Delta export intakes occurred at the end of October 1984 (Figure 3) under low Delta inflow/outflow conditions (Figure 4). This is important because DWR, in its assessment of the WaterFix Project, is maintaining that export restrictions during the first fall and winter flow pulses will be protective of migrating juvenile salmon. But pulse restrictions alone would not be protective. WaterFix would nearly double the export capacity of the State Water Project. Actual fall exports could increase by 50%, with much of the increase coming from the trio of new North Delta Diversion tunnel intakes that lie directly in the migration path of young winter-run salmon. Figure 1. Unusually high federal exports occurred in fall 1975, 1980, and 1984 (red circles). 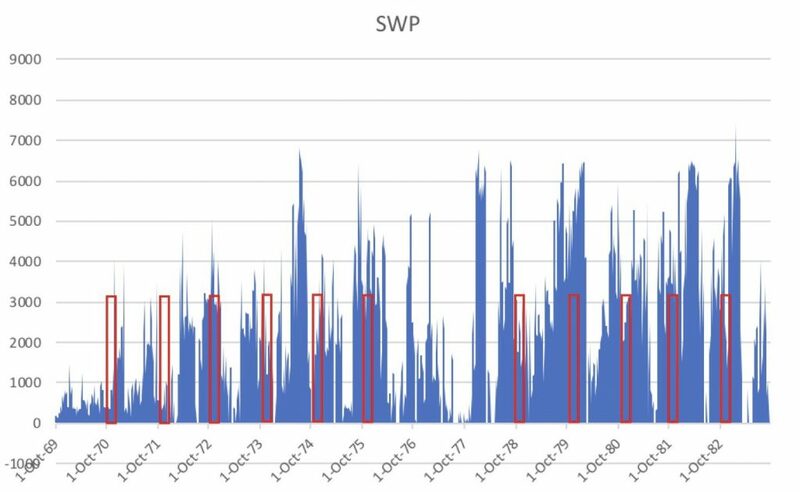 Figure 2 Delta SWP exports in daily average cubic feet per second from 1969 through 1983. Figure 3. Chinook salmon south Delta export intakes salvage in fall 1984. Figure 4. Delta inflow from the Sacramento River August 1984 through March 1985.